Ukulele Mele On Maui re-launches online lessons and downloadable lessons and announces private lessons, workshops, and packaged song-sets are no longer available in 2019. ‘Ukulele players can continue to learn Mele’s method of forming ‘ukulele chords with minimal muscle strain and unique strumming styles to fun, sing-along songs from wherever you live! No one else teaches this method. You can benefit from choosing how you want to learn, solving problems from trying to teach yourself by learning from a professional, applying new techniques to your favorite songs, and gaining an authentic Hawaiian cultural experience learning to the ‘ukulele, Hawai’i’s official instrument, from a Native Hawaiian. 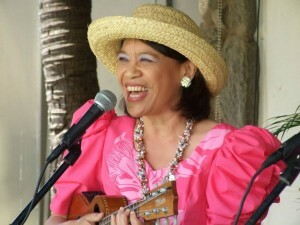 Mele Fong, aka Ukulele Mele, is an experienced educator and professional singer and entertainer with over 50 years experience playing the ‘ukulele. Each lesson includes song sheets, video lesson, video story behind the songs, and audio recording for each song. The ability to read music is not required. Song sheets show the lyrics, ‘ukulele chords, and strum graphic showing the motion of your right hand and rhythm pattern with a catchy fun name to remember the strum. There is no need to sing and play your instrument at the same time – the audio recording of vocals with ‘ukulele and ‘ukulele bass accompaniment is provided for you. There are two ways to learn the Ukulele Mele Way by subscribing to Online Lessons here or by downloading Single Song Lessons here. Beginner Online aka Ukulele Mele Basics – One Month Trial $25 for 8+ lessons or save $5 for Recurring Monthly Package. Intermediate aka Ukulele Mele Beyond the Basics – One Month Trial $35 for 16+ lessons or save $5 for Recurring Monthly Package. Advanced Online aka Complete Monthly Online Lessons – One Month Trial $55 for 50 lessons or save $5 for Recurring Monthly Package. Or download single song lessons. There are 55 songs to choose from Hawaiian, hapa haole, pop, and Christmas genres. Are UKE having fun yet? Have fun learning the Ukulele Mele Way from wherever you live today!